As mentioned in the “Educational” post, many property committees (under the leadership of Eric Busch – the property manager) have been working on many ideas for restoring and using the property. Alice Publow documented the current property key aspects in the following drawing she made after a detailed walk around. This drawing is intended to document the starting point before future work commences. Among other features, the drawing shows the extensive fill (cross-hatched area) loaded onto the back side of the island by the previous owner. This winter, information will be gathered and specific advice will be sought on native trees, shrub, rushes and wetland grasses as well as wildflowers and beneficial vegetation. In the spring, location of the existing vegetation will be mapped after growth allows identification. I should mention, that all ideas for the property will be considered. If you have ideas, or would like to be involved in the process, please contact one of the officers or board members listed in the category “Who We Are” under the tab “Loon Lake Watershed Improvement Alliance (LLWIA)” on the front page of the website. 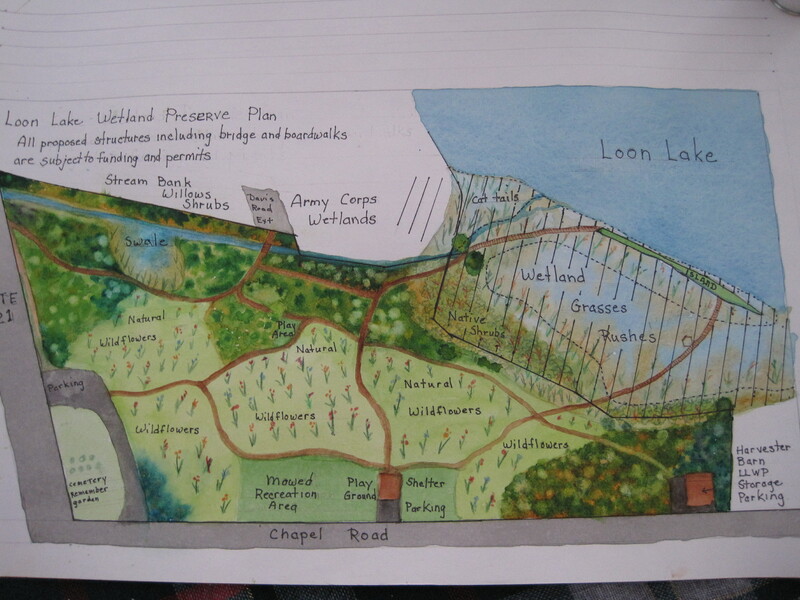 The following drawing shows some of the many ideas for trails and other features that would improve the educational value of the property.